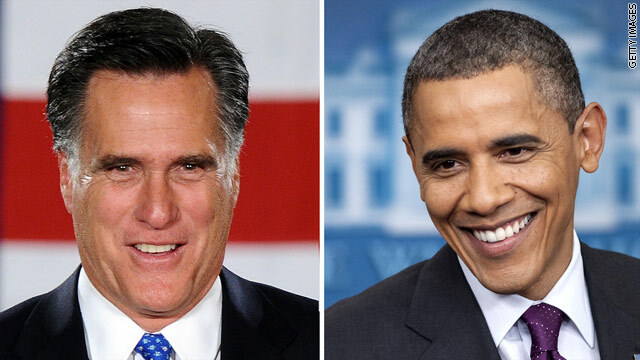 President Obama welcomes his opponent in the 2012 campaign, Governor Mitt Romney, to the White House today for lunch. The much-anticipated meeting will happen today at 12:30p as the two men sit down in the private dining room of the White House. Unfortunately, there is no coverage of the event so we hope that the White House will release a photo. Beyond that meeting, the only other meeting on the president's schedule is a meeting with American Nobel prize winners. That, too, is not open to the press. Presumably, the remainder of Obama's day will be spent behind closed doors, working on a solution to the impending fiscal cliff crisis. White House Press Secretary Jay Carney will brief reporters while Romney and Obama are eating lunch. Only Presidential looking and acting people win elections to be President. And when they win the election twice, it's because, not only do they look and act presidential, but they have a proven track record. Does that also apply to President George Bush? According to you Linda ... George W. Bush was Presidential, deserved to be President, and had a good track record ... and, I agree. Mitt Lost Obama Won. Let it go man...let it go. This blog site doesn't need the 'stench' ... and, yet you're still allowed to post here. OF COURSE I'M ALLOWED TO POST HERE. I DIDN'T HAVE A BACKSTABBER FOR A RUNNING MATE. get over it buddy, Obama is in there for four more years, and what a great president he is. Denial is more than just a river in Africa. looking presidential and being presidential are two different things. Obama is both. The Republicans have already served up KICKED TO THE CURB SANDWICHES to ol' Mitt, so my guess is, the President just might be in the mood to serve up JUST DESSERTS. Bon Appetit. I wonder if "THE LITTLE MATTER OF YOUR TAX EVASION" is on the menu?? If I were the President, I would have slipped into the kitchen and peed in his cobb salad. Glad you're not President. You need to move past those bad-boy movies. There should be no Cabinet post or administration role for Mitt Romney. He's anunprincipled hypocrite who ran a vicious campaign full of lies And boasted of his contempt for nearly half the American people. There are many able people in the U.S. well-qualified to serve this administration. Romney is not one of them. Lunch Menu Specials for today: Money taken away from hard working middle class. Starter: under the name of closing the loopholes, mortgage deductions, dependent child deductions. Dessert: Social security, Medicare Medicaid benefits reduced. In the end both parties and all sides will screw the middle class and protect the lobbyist from both sides. They will do the mistakes and we will pay for it. Okay, I would have to give a thumbs up to the President for meeting with Mitt. Romney has good business sense and understands the economy. This would be a good time to tap into Mitt's ideas. I would find it interesting to see what comes out of it. The juiciest, most delectable item on the menu would definetly be, "HOW THE WEALTHY HIDE THEIR MONEY. I'm sure that the President would be willing to give Mitt public kudos for a few good business ideas of his IN TRADE for that info. Bring it on boys – Enquir-ing minds want to know, will it be splashed on the pages of the rags or, will he give up TRADE SECRETS.....in secret. Myth Rmoney, the tax cheat and LIAR, has ZERO "good" ideas. The president is just showing a good sportsmanship, he has nothing to do with Romney's advice. you might want to find out how many CEO's the president meet every time he invite them to the white house. Judy, Mitt did not simply break companies and ship them oversees. He invested in a number of businesses in the US that became successful. Staples is a very good example employing about 90,000 today. It started as a single business that Bain invested in. Buffet and the other CEOs have not governed a state. As many of you have stated before the election, running government is not like running a business. Romney has experience in both. If Mitt Romney were truly eating crow, then maybe he would have declined the invitation. Give him at least some credit. Actually Staples is much like Wal-Mart it has driven out small existing office supply businesses, under-cut new big box competitors so they most often they open and close within a year. However, Staples is currently in the process of closing many of its stores, cutting store square foot size, cutting staff, and concentrating more on online sales. I think due to their eradication of local competition more people are shopping on line. FAIL – Rmoney is a liar and tax cheat. Bob, where is your proof that he cheated on taxes? I am certain that if we look back to 2008 we will find some promises left unfulfilled by the President. Your candidate won the election. Maybe you should listen when he called for civility. Or were those just meaningless words? "Bob, where is your proof that he cheated on taxes?" The simple FACT he would not release his tax returns. End of story. At the very least we should appreciate the fact that these two men can act like adults. I AGREE. MITT ROMNEY SHOULD PAY FOR HIS OWN LUNCH AND TREAT THE WINNER. Winner? All of America lost on Nov. 6th. And Mitt Romney's generosity should not be ridiculed. He would have refused his salary as president as he did when he was governor, and head of the Olympics. Obama takes all the taxpayer money to go out on date nights to NY and extended Hawaii vacations. Winner? OBAMA IS THE WINNER AND YOU ARE A WHINER. STOP EATING SOUR GRAPES FOR LUNCH. No one is going to stand for yours and the president's bullying mentality anymore. Makes you fell big and smart? Again, it's not about winning or losing. It's about what's best for the country. I think Romney and Ryan would have lead this country in a much sounder direction. It's a free country – I am entitled to my opinion. "And Mitt Romney's generosity should not be ridiculed"
WHAT "generosity"????? He gives his ill-gotten money to his CULT. The rest he hides overseas in tax havens. I DON'T THINK HE WILL ORDER THE 'HAPPY' MEAL. His dog Shamus might have suggested, McMutt. Then we'd all be on equal footing. God Bless, America. Your reading comprehension is sagging under the weight of your eyelids. Happens to the best of us. I know you guys do not accept criticism of Obama, and my personal beef right now is with Reid, so I'll just stop trying to criticize him in response to your false criticisms of Republicans. OH SURE, PICK ON ANOTHER MORMON. Poor Obambi-Poo - not a very good day for the POTUS. Gov. Romney was not invited to the W.H. for an hour of turkey chili and general domestic/foreign chit-chat. Whatever the Devious One (and possibly Deval Patrick) had in mind, a thousand tipped-off Republican eyes were on guard like hawks. The Democrats were prepared to steam roll their version of the budget over the GOP - nice try fools, no matter how you spin it. Last, it is a happy day for the Palestinians. The United States is on record as opposing the U.N. upgrade. A good day for Romney - as Obama's grasp on power slowly continues to deteriorate. well the president gave him a little over an hour of his time.camaron I know that mitt invested in American companies too. Yes I know about staples ask the employees how much they make. Mitt made a bundle for the investors though. He also hides his money overseas so explain that one. we should make a law that if you run for president you not only have to show tax returns but not get out of paying your taxes. What are you talking about December, I supported Romney, or as you would know him Satan. And I don't care what race or religion he is... A Mormon can be just as stupid or smart as anyone else. And Harry Reid isn't the smart choice. Ha ha, I know mittens was hella mad, "just think, if I coulda lied better/more, or the american ppl were stupid, I could live here"